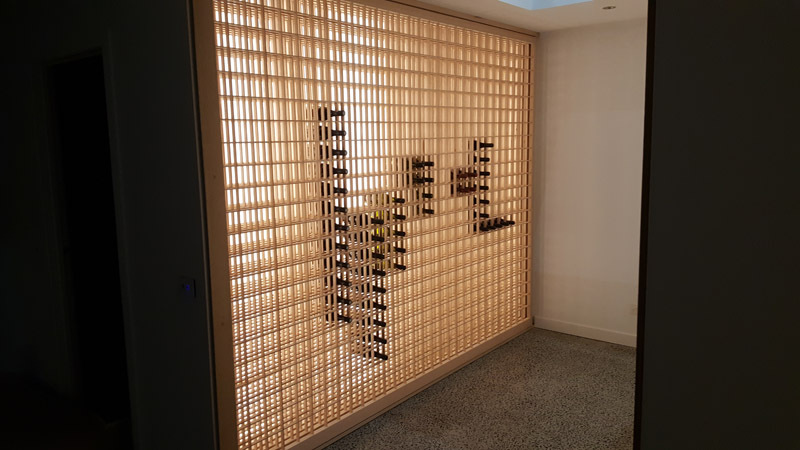 Robert Rolls’s love of Japanese design and fine woodworking has led to the cross pollination of wine rack and Japanese rice paper screen. Robert has spent considerable time in Japan during his building career and bring traditional Shoji craftsmanship to these pieces. The slatted timber “kumiko” is half checked on alternate sides to enable the timber to be weaved. This provides equal timber pressure to both sides, keeping the finished lattice work straight. This installation was backlit providing a subtle warmth through the rice paper and wine bottles.